Last week (27th February 2014) practitioners and policy makers from across the island joined the Jersey Centre for Separated Families at the Royal Yacht Hotel in St. Helier for our formal launch. 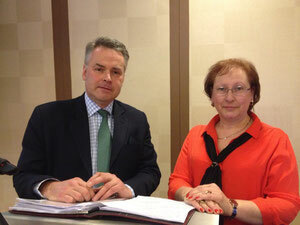 Tim Loughton MP with JCSF Co-ordinator, Denise Carroll. 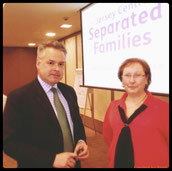 Also joining us were the former UK Children's Minister, Tim Loughton MP, who gave a welcoming speech, and Karen Woodall from the Family Separation Clinic in London, who opened the event with a presentation on the policy background to family separation and offered praise for the work we are doing on Jersey. Tim Loughton spoke about his passion to help parents who are going through divorce or separation to put the needs of their children first. He talked about the cost of separation, not only to families themselves, but to wider society and also the difficulties that children often face. He talked about the need to put children at the heart of decisions after separation but acknowledged that it was often difficult for parents to get the help they needed. He also referred to the work he had done in the UK Parliament to increase the number of children living in shared parenting arrangements. Karen Woodall explained how important it was for children to maintain meaningful relationships with both of their parents after a separation and how she believed it was necessary to interrupt the cycle of inter-generational family breakdown. 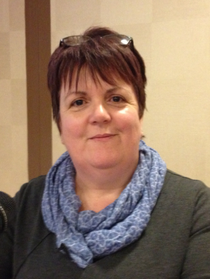 She particularly welcomed the work of the Jersey Centre for Separated Families as an example of how effective community enterprises can be in delivering services, arguing that they can support families in ways that big government initiatives often fail to. In the afternoon, Deputy Judith Martin, Assistant Minister for Health and Social Services, and Advocate Vincent J. Obbard, the Patron of Milli's, gave presentations welcoming the development of the Centre on the island. In addition to the formal presentations, the launch was treated to two workshops. The first being on supporting separated families which looked at the myths and stereotypes that can get in the way of service delivery and the second looking at high conflict separation and parental alienation. There was also a panel discussion which brought together Tim Loughton, Karen Woodall, Denise Carol, who co-ordinates the Jersey Centre for Separated Families, Judith Martin and Jane Ferguson of JFCAS, to answer questions from the floor.